Sojun Mel Weitsman, Eijun Linda Cutts, and Rinso Ed Sattizahn will officiate. On the day of the ceremony there will be very limited street parking, so if you plan to attend in person we encourage you to take public transportation or carpool to City Center. In the Buddha Hall, seating will be available on a first come-first serve basis, with reserved seating only for those with ceremonial roles. Overflow seating with livestreaming video will be available in the Dining Room and Sangha Room. Zenkei Blanche Hartman died peacefully at 12:30am the morning of Friday, May 13 at Kaiser Hospital in San Francisco surrounded by her family. She was 90 years and five days old. 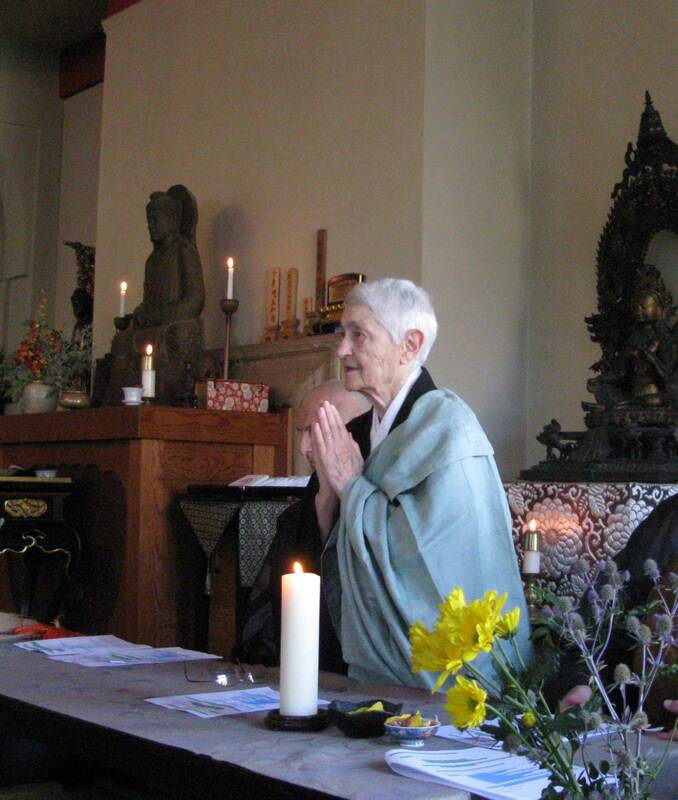 All three Zen Center temples rang the densho bell 108 times and held ceremonies to acknowledge her passing over. Blanche’s body rested in the Buddha Hall at City Center for three days, according to her wishes, and her family, students, and friends came to sit with her, day and night. She was cremated on May 17 in a small private ceremony. We have been holding a weekly memorial service every Friday, as is our tradition. On Sunday, July 10, we will hold the final service in the Buddha Hall at City Center. To post messages, see photos, read memorials, or make a donation in honor of Blanche, see also For Zenkei Blanche Hartman. This entry was posted in Updates by Web Editor. Bookmark the permalink.